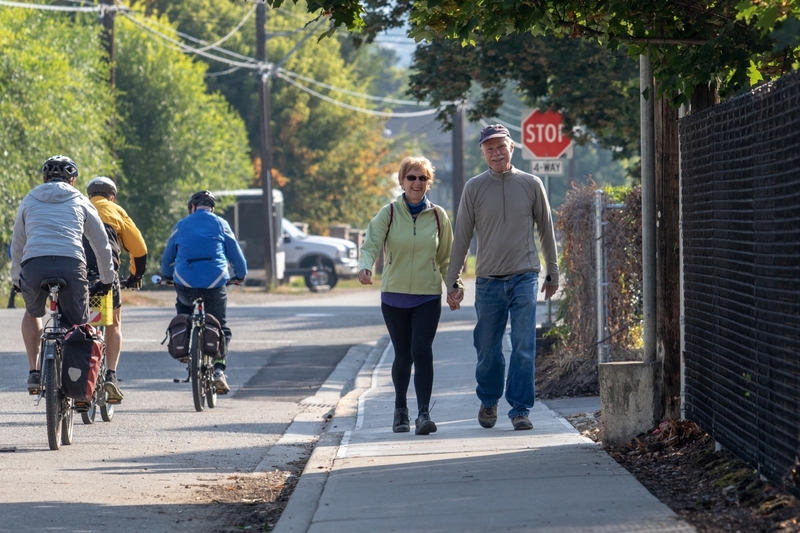 The City of Vernon, ICBC, and the Vernon North Okanagan RCMP are reminding drivers, cyclists, and pedestrians to keep their heads up as the days get darker and collision risk increases. During the month of November, RCMP officers, volunteers, and City staff will be on site at high risk locations throughout the city distributing reflectors and safety information for drivers and pedestrians. Join the conversation online using #Headsup! Drivers, keep your heads up for pedestrians and cyclists, especially around intersections and in low light. Pay attention. Avoid distracted driving, including texting, and watch for vehicles slowing down around you as they may be yielding to a pedestrian. Follow traffic signals rather than pedestrian signals, which aren’t always timed to traffic lights. Make eye contact with pedestrians and cyclists. Pedestrians and cyclists should remember to be seen, be safe, and be lit. Wear bright and reflective clothing to be more visible. Be predictable and pay attention, especially at intersections, and avoid distractions like texting. Cyclists are reminded to use white front lights and red rear lights during low light conditions and during inclement weather. Fall weather can mean slippery conditions; watch out for wet leaves and roads debris, and consider the switch to winter bike tires as the weather gets colder. Be alert for cyclists and pedestrians at all times, especially at intersections, crosswalks, downtown and even more so in low light or poor weather. Be aware that cyclists may manoeuvre unexpectedly to avoid hazards like ice, potholes, or puddles. Pay attention. Avoid distractions, focus on driving. Make eye contact with pedestrians and cyclists. Watch for vehicles slowing down around you. They may be yielding to a pedestrian. Heads-up at intersections. Follow traffic lights, not the flashing hand or countdown signal. Pedestrian signals aren’t always timed to the light. Be lit! Wear or carry a light at dusk, in low light or poor weather. Wear white, bright reflective clothing. Cross with care. Make eye contact with drivers and wait until traffic has stopped before you cross. Pay attention. Avoid distractions like texting. Be predictable. Use crosswalks and intersections. Walk on the left side facing traffic where facilities exist. Never jaywalk. Heads-up at intersections. Stop, look and listen. Look both ways. Don’t start to cross on a flashing hand. Countdown timers tell you how long you have left to cross. Use lights. Use a strong white headlight and red taillight. Wear white, bright reflective clothing. Be predictable. Ride in a straight line at least 1m from the curb so you can move around hazards like ice, water, and road debris. Do not dodge between parked cars. Always ride on the right side of the road. Heads-up at intersections. Stop, look and listen. Make eye contact with drivers before you proceed. Pay attention. Shoulder check regularly and watch out for car doors. Prepare for the weather. Year round cycling means taking extra care in slippery conditions. Plan for sudden weather changes and be prepared to adjust your route and speed. During the fall watch out for wet leaves and icy patches, especially on cold mornings. Wear a helmet. It's the law. For more information about cycling safety, visit www.bikesense.bc.ca.